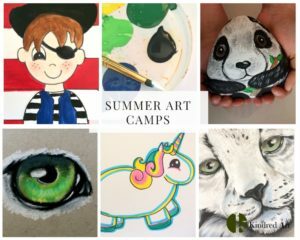 I’m looking forward to moving forward with a beautiful summer and know that your children will love this opportunity to create and find confidence in their artistic ability. I have wonderful lessons ready and hope your children can join us this summer! I have found a beautiful place to host art camps. 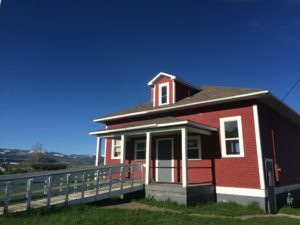 The historic school house near Anderson School! This school house is adorable. Bright windows throughout, and blue skies to be seen. Themes will change every four weeks. Head over to the Registration page to get your child’s spot reserved. Limited spots available! Come to the imaginary land of prince and princesses. 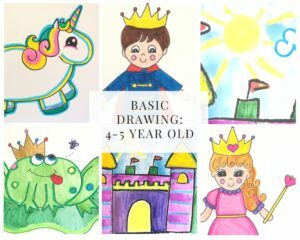 Children will love the sparkles and jewels they will add to their self portraits and the variety of clothing and crown options. Learn how to draw your own version of a castle and have fun with the oil pastel watercolor resistant effect. Children will love deciding to add a drawbridge flags and much more. Don’t kiss the frog! Design your spots and get out the gold paint. Do you want the tongue out, what kind of bug? A butterfly a bee or a fly just a few of the questions to get your children thinking! Unicorn to follow and boys and girls will both love this colorful horse! Ahoy there Matey, Welcome to the land of pirates! 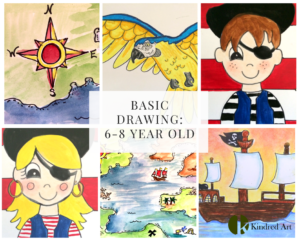 Self portrait as a pirate will be sure to bring creativity in color options, eye wear hat and clothing design and hair style. Acrylic paints will used and children will learn how to hold a brush and outline with paints. Design your own treasure map, will challenge children with a variety of subjects such as whales tall ships castles jolly rogers and much more. Watercolor paints and colored pencil techniques will be taught. Draw a clipper ship. Tons of design ideas as your child designs their ship. Techniques will be taught on how to shade with chalk pastels to create a beautiful sky in the background. 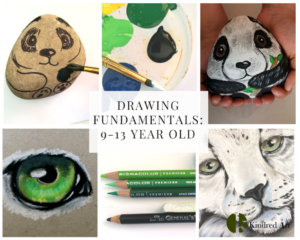 Your child will love painting their cuddly panda rock! These rocks can stay indoors in your child’s bedroom or outdoors in the garden. Acrylic paints and sharpie markers. Children will be taught how to draw the panda on a rock, and how to use proper brush strokes to create fur. Snow Leopard will involve drawing a leopard face or body, using pencils, white charcoal and carbon pencil. Children will be learning how to smear the charcoal and how to use toned paper in their artwork. The Colored pencil burnishing technique will be taught and they will learn where to put their shadows and highlights in the eye and how to get the glow effect. Hi! Do you offer art enrichment for kids during school year? I have 3 kids living in Bozeman. I would love to talk to you more about lessons I offer during the school year. I will email you with more information! Thank you!